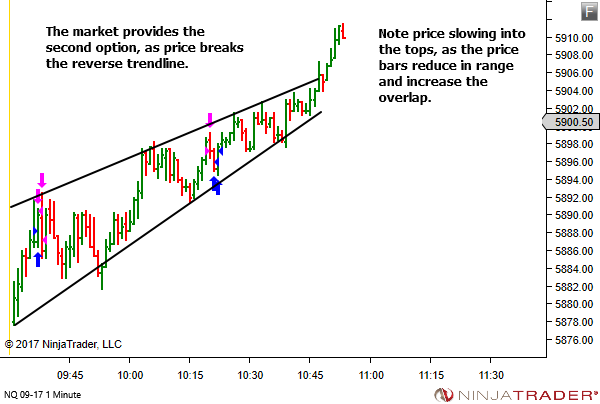 The market opened and settled quickly into an uptrend. It was an environment I found difficult to trade for some reason. Decision making was poor. And I just couldn't get in sync with the price movement. This was a fact that became clearly obvious after two suboptimal trades (small profit so it's all good). 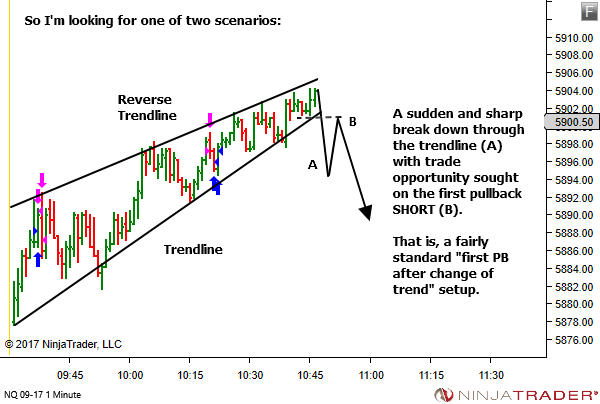 Stand aside until price breaks from the current structure. 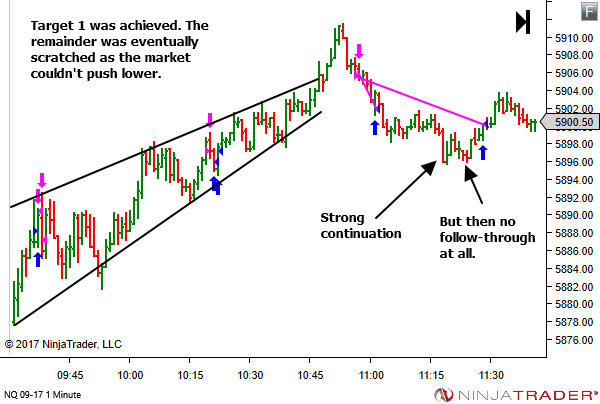 The current structure was an uptrend. But not a nice one. Small swings, getting smaller. 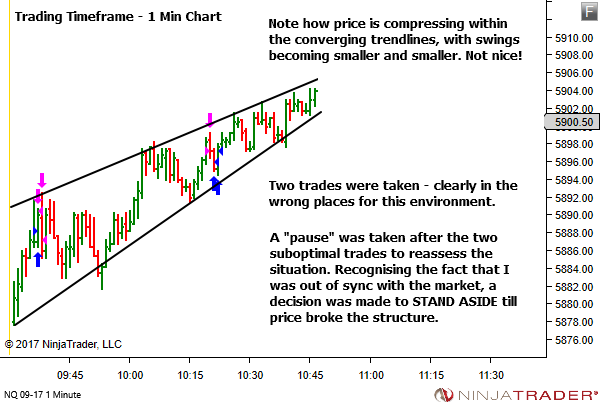 I don't use trendlines, but they will help show what I was seeing within the structure, as the trendlines above and below price both converge on each other. This time we got a break of the reverse trendline. From a strength/weakness perspective, an acceleration of price like this gives an appearance of strength, but it's not usually the case. Such a steepening of price is unsustainable and will exhaust itself. 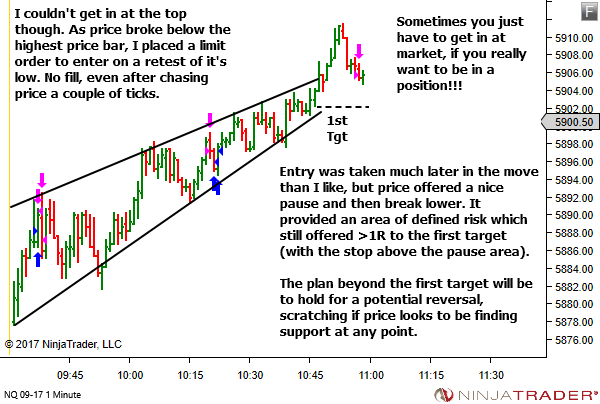 Any strength is actually short-lived and will often (but not always) provide opportunity back to the last area of congestion prior to breakout. 1. Two suboptimal trades are an indication that you're potentially out of sync. Pause. Step back from the charts. And reassess. 2. When you recognise yourself being out of sync with the market, consider standing aside until price breaks from the current structure. 3. 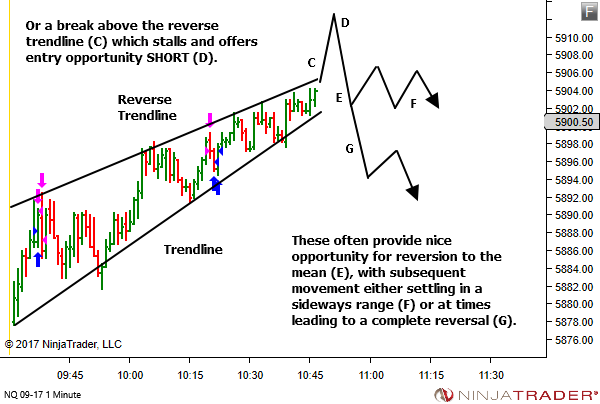 A reverse trendline breakout is usually played initially for reversion to the mean, with the remainder held for potential reversal (until proven otherwise). Love learning from new people. Thanks. And all the best of luck with your trading.